LANGALIST: Why won’t some Win10 PCs update? It’s taken three and a half months of planning and pushing, and some sleepless nights, but a major changeover has arrived. Over the weekend, we started merging the Windows Secrets Lounge — a phenomenal resource of more than a million posts — into AskWoody.com. It’s taking a while; it’s an enormous amount of data. If you were a Windows Secrets Newsletter subscriber, you probably knew about the Lounge. For many years, dozens of forum admins, moderators, MVPs, VIPs, and cognoscenti of all stripes have helped Windows and Office users solve frustrating, strange, bizarre — and sometimes surprisingly simple — problems. Working 24/7 for no pay, a crew of dedicated volunteers solidified the Windows Secrets Lounge (WSL) vision: an independent, customer-first island of help in a sea of bias and obfuscation. This changeover marks the penultimate step in AskWoody LLC’s acquisition of Windows Secrets, preserving the site’s accumulated knowledge under the AskWoody umbrella. We still need to bring across all the old newsletters (which will be freely available for everyone), but we have to build an infrastructure for them first. Here’s a huge thanks to the dozens of Lounge volunteers who kept the forum alive and kicking through thick (sometimes very thick) and thin (even more so). Withstanding years of wavering corporate support, the core Lounge team has held fast and pulled together as one. My hat’s off to ya! And with that, I’m extremely pleased to announce that most of the WSL team will migrate over to AskWoody. Many of the technology MVPs and VIPs you know are here, too. Drop by AskWoody.com and take advantage of the free help in the AskWoody Lounge! If you had an account on the Windows Secrets Lounge, we’ve posted a special landing page for you that’s chock-full of tips and pointers. And if you’re new to the AskWoody peculiarities, be sure to check out our Welcome Page — then dive in! Do you have a proper AskWoody account? A reminder: If you’re currently using an email address as your AskWoody account name, please get it changed. To see your given username, sign in and then open your profile by clicking the link below your avatar (the picture in the upper-right corner — which might just look like a gray watermelon). Click Edit. The username field is under Account, down the page a bit. Note that it’s grayed out. You can’t change it. As we’ve mentioned before in the AskWoody Plus newsletter, you really don’t want to use an email address as your username. There are lots of reasons why, but the big one is privacy — if you post something, your email address will be hanging out in the breeze for anyone to see — and for every spider to crawl. It truly is A BIG DEAL! Again, you won’t be able to change your current username — it’s a WordPress thing. Instead, I have to blast away the old account; you can then register a new one. I can step you through the process. It takes only a few minutes, and you won’t lose your Plus membership. Promise! Just send me a note at CustomerSupport@AskWoody.com. Leaving Windows Secrets on a sour note? I’ve received several emails complaining about recent credit-card charges to “Windows Secrets LLC.” Alas, I can’t do anything about those charges — your money went to a subsidiary of a subsidiary of a multi-billion-dollar conglomerate. Sadly, I can’t tell the credit-card company to give your money back. I have tried to get the automatic renewals canceled — no luck. If you see a charge to “Windows Secrets LLC” on your credit-card statement, do us all a favor and contest it. Then write to me at CustomerSupport@AskWoody.com; one way or another, I’ll make you whole. You shouldn’t get stuck holding nothing. If you want to donate to AskWoody LLC (that’s the name you should see on your credit card or PayPal payment), bless yer heart — we can use it! Send any amount you think appropriate. Better yet, convince your friends or family or boss or hairdresser’s boyfriend’s jet-ski mechanic to sign up for a Plus Membership. Why won’t some Win10 PCs update? A number of LangaList readers have reported being still stuck with a year-old version of Windows 10 — Release 1803. They don’t know why their setups will not or cannot upgrade to the current version! Here’s an example — and a path to possible fixes. Plus: A recent Windows 7 upgrader is seeking a classic “no-reformat, nondestructive reinstall” for Windows 10. In “Windows Update errors cause OS-version problems” (AskWoody Plus newsletter 16.8.0), I described how Microsoft’s recent four-month-long series of Windows 10 update problems left some readers’ PCs in the weeds. They’ve never received last fall’s major upgrade to Version 1809. And in “Seriously: Check your Windows version now!” (newsletter issue 16.11.0), we saw how Version 1803’s Windows Update might still be reporting “You’re up to date” — despite Microsoft’s having released Version 1809 close to six months ago! Compounding the confusion, Windows 10 Version 1903 is almost out! If you’re still running Win10 1803, you’re almost a full year out of date! “Fred, I’ve been stuck on Version 1803. So thought I’d try forcing it, as per your article. “After three or four hours of a black screen, I hit the reboot button. My system came back as a damaged Win10 1803 — no Windows Update in Settings, and I lost all my restore points. “I just tried again, and watched the process from the start. It went to 26 percent and then rebooted to a black screen for seven hours. So I tried rebooting — no go. I powered off and restarted, but got the same result. I wrote back to Peter, suggesting he use Windows’ built-in System File Checker (SFC). If you enter sfc /scannow into an admin-level command window and click Enter, the tool will scan all protected system files for problems and will, if possible, repair them. Peter’s lost restore points made me wonder what other roll-back options might also have gone missing in the churn. But SFC was certainly the right tool to start with — well worth the shot at trying to get the PC minimally working again. “I’ll try again by disconnecting my external hard drive and my link to the Internet — that seems to be the popular opinion. “Do you by chance have anti-rootkit protection installed? Those security apps and some related parts of aggressive anti-malware tools can interfere with the Windows-update installer. They “protect” the old setup’s configuration by blocking the switchover to the new system files and data. Your PC can’t complete the new setup, and the update fails when it tries to reboot. Figuring out the meaning of the numeric error message was the key to solving this riddle. For updating errors — or any kind of Windows error — doing a search on the error’s numeric designation can often lead you to an answer — or at least get you pointed in the direction! For example, numeric Update errors in the 0xC1900101-x200xx range usually mean that Windows Update encountered a low-level foundational error, and it couldn’t boot into the minimal setup it uses midway through the update process. For example, bad or incompatible or corrupted storage drivers (hard drive, SSD, etc.) will generate a -0x20017 error. Update errors in the -x300xx range usually signify trouble later in the process, when new features and other (not necessarily foundational) drivers are being layered into the new setup. Errors in the -x400xx range usually occur during the last stage of updating, when the old copy of Windows tries to fully switch over to the new. This is where Peter’s installation failed; his anti-rootkit app “protected” the old setup, leaving his PC with a fatal mix of old and new system files and settings. Once the anti-rootkit app was out of the way, the update could finally eliminate the old setup and switch to the new. Error numbers are potent troubleshooting tools not only for Windows Update problems, but across the board with PCs. You can often find the meaning of just about any error message by doing a general Web search for either the specific error number you’re seeing or, if no number is provided, by searching for the exact verbiage of the error message. AskWoody Plus reader Bill asked about possible Windows 10 versions of a popular Win7-restoration technique. “Hi, Fred! I’ve been saved many times in the past by your nondestructive reinstall method for Win7. Is there a nondestructive reinstall method for Windows 10, using the installation media? Yes — more or less. 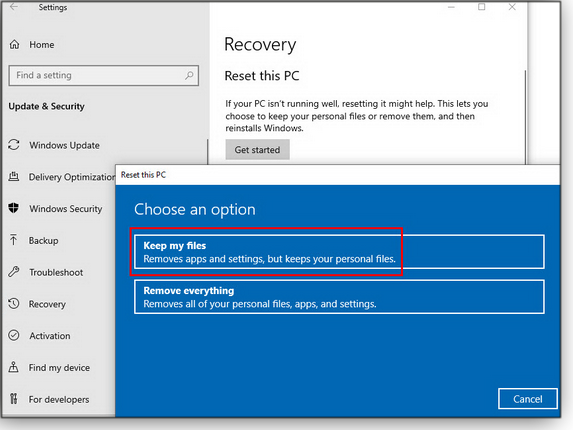 Win10’s built-in Reset this PC function has a Keep my files option that returns Win10 to its just-installed state — but with your standard user files (e.g., everything in your Documents folder and subfolders) left intact. Figure 1. Win10’s Keep my files option refreshes system files while leaving user files alone. This system-restore technique reinstalls Win10 with fresh files, automatically retrieved from the Microsoft servers. It doesn’t reformat your drive, and it won’t touch user files. If you sign in with a Microsoft account, Reset this PC/Keep my files will also try to restore any personal customizations (themes and so forth) previously and automatically stored in your OneDrive cloud account. It will also reinstall and set up any apps you previously downloaded from the Microsoft Store. Note: This process will remove any third-party desktop apps and drivers you’ve installed, in order to return the system to its default settings. Those apps will have to be manually reinstalled. To make this step a little easier, the Reset/Keep my files option places on the desktop a list of all removed apps. You’ll also get links to the websites of any removed apps that Windows knows about. Using these links can greatly speed up and simplify reinstalling those missing apps — it also helps ensure that you have the latest-available versions. Any listed apps that don’t include links must be restored the way you originally installed them — from a DVD, downloaded installation file, etc. So, while Reset/Keep my files isn’t exactly the same as the old, Win7 no-reformat/nondestructive reinstall, it accomplishes much the same thing! Fred Langa has been writing about tech — and, specifically, about personal computing — for as long as there have been PCs. And he is one of the founding members of the original Windows Secrets newsletter. Check out Langa.com for all Fred’s current projects. This past Patch Tuesday, lots of Windows 7 and Windows 8.1 users got a rude surprise when they installed the April updates — systems that locked up during boot or experienced other freezes. The early reports pointed at a conflict between April’s monthly patch rollups and Sophos anti-malware applications. Sophos quickly acknowledged the problem, stating that the two applications involved were Sophos Endpoint Security and Control and Sophos Central Endpoint Standard/Advanced. Over the next few days, there were additional reports of problems with Avira and Avast. Windows 7 users should pass on these April updates for now, but you do want to install KB 4490628, a March servicing-stack update that will be required for receiving future patches. If you didn’t receive it in March, or you didn’t install it, you should see it offered again once you’ve (eventually) installed the April updates. Again, you need this update. What to do: It wouldn’t be a surprise if other issues showed up with April’s rollup and security patches. Give them a pass until we give the all-clear on AskWoody.com and in the next Patch Watch column. Microsoft is polishing up the March … I mean April … well, more like May release of Windows 10 Version 1903 (no clever name, yet). If you’re a Win10 user who likes to pick and choose feature releases, it would behoove you to download and save a copy of Version 1809 — and soon. An AskWoody post tells you how. As an aside, we now know that mixing Win10 versions can lead to trouble. Some users who installed the March Preview Update for Win10 1809 ended up with blue screens of death. As reported by Woody, the issue appeared when users customized Version 1809’s installation to include Media Center fonts. AskWoody forum MVP RC Primak points out that customizing your computer by replacing current files with older versions will drop your machine into unknown territory. In other words, putting old Windows code onto newer platforms — especially with feature and cumulative updates — is a recipe for trouble. Neither problem is a deal-breaker, as far as I’m concerned. But it’s still early in the month, and other issues might still pop up. For example, there are reports of trouble on Win10 1809 systems that have Arcabit antivirus installed. Among other items, the update for Version 1803 includes protections against Spectre Variant 2 (CVE-2017-5715) and Meltdown (CVE-2017-5754) for VIA-based computers. NOTE: If you’re still on Win10 1709, here’s a final reminder that April’s patches are the last you’ll see for machines running Home, Pro, Pro for Workstation, and IoT Core editions. It’s past time to update to a more current release. And all Windows users who have Adobe Flash Player installed need to apply the April update, as noted in an Adobe bulletin. Microsoft’s Flash fix for Windows 10 and Windows 8.1 is KB 4493478. Look for updates to Chrome as well. As is common when a new Win10 release is coming, we start to see compatibility patches that pave the way for the upgrade. For example, in April Microsoft released KB 4490480, a compatibility update for older Win10 versions designed to smooth the transition — to Win10 1809. Microsoft also released KB 4493510, a servicing-stack update for Version 1809. It fixes a device-driver problem that might leave your PC unbootable after you apply the Reset this PC recovery option (Settings/Update&Security/Recovery). What to do: Install the separate fixit and Adobe patches when offered, but hold off on the monthly security-only and rollup updates until we give the all-clear. If you’re still managing Server 2008 SP2 systems, you must install KB 4493730 in order to receive future updates. This servicing-stack fix is yet another of the SHA-1–related updates I discussed in a recent AskWoody post. Remember: You must install this update all by itself. Windows Update will typically offer this fix as a separate patch. What to do: Install KB 4493730 when offered. A leftover from March is KB 4489893, the Monthly Preview Rollup. Pass on it if it’s still offered. Released April 9, KB 4493435 is the regular Internet Explorer 11 patch — which you need only if you installed the security-only update KB 4493467. Again, April’s Adobe Flash Player fix is KB 4493478. What to do: Install the IE 11 and Flash Player patches as soon as convenient. What to do: Wait for our go-ahead before installing these updates. April has the now-familiar mix of Office security updates, Japanese-era fixes, and nonsecurity patches. The following security updates were released on April 9. Most of these patches for Office 2010, 2013, and 2016 include a remote-code-execution vulnerability fix. What to do: So far, there are no reports of problems with these updates. Still, no harm in putting them off a while longer — unless you need a specific fix. 4487563 – Security patch for Exchange 2013, 2016, and 2019. What to do: Check the list of known issues online, and remember to make a full backup of your systems before installing any of these updates. In real life, Susan Bradley is a Microsoft Security MVP and IT wrangler at a California accounting firm, where she manages a fleet of servers, virtual machines, workstations, iPhones, and other digital devices. She also does forensic investigations of computer systems for the firm. As a working professional, I attend a lot of meetings. I’m really busy — like all-the-time busy. If something doesn’t hit my calendar, either personal or business, then it simply doesn’t exist. My Outlook calendar is an extension of my brain, and I’ve turned over all scheduling to it. I’m not alone — even with the nonworking parents I know, it’s: Calendar it, or else! Over the years, I’ve developed some pet peeves about scheduling. These are things that can really mess up my day. I’m sure most professionals can relate to them. An appointment gets rescheduled, but the new time and the original time are now both on my calendar — and I don’t know which is correct. Ditto for an appointment that gets canceled. Why is it still on my calendar? An email or some other type of message tells me when and where to be, but there’s no way to automatically add it to my calendar. A meeting notice doesn’t say where to meet! Fifty emails from five people trying to figure out which time is available for everyone to meet. I kid you not — 50 is no exaggeration! I’m going to discuss how to use Outlook calendaring to set up and manage appointments and meetings with others. But if you’re using Google or some other application, similar features are available there, too. You’ll just need to adjust the terminology to what your email and calendaring system uses. The last item on my pet-peeve list is actually the first task in setting a meeting: finding a time that works for everyone. Outlook has a great add-in for this called FindTime. To get it, click the Get Add-ins button on the Outlook ribbon, which will take you to the online Office Store. Once there, search for FindTime and download it; it’ll then show up in the ribbon with your other add-ins (see Figure 1). Note that the desktop version of Office 365 may not have an obvious Add-in section on the ribbon. In one of our tests, installing FindTime started out on the online version of Office and eventually made its way to the desktop copy. But it only showed up when you created a new meeting. Figure 1. Once installed, the FindTime add-in showed up alongside my other add-ins. Now, whether you’re in Outlook’s email or in the calendar windows, you can press the FindTime button and select days and times that work for you. (The button will show “Reply with Meeting Poll” if you’re in an email or “New Meeting Poll” if you’re in your calendar.) Next, send the meeting request to all attendees; FindTime will direct them to select times on your list that work for them. The tally happens live (see Figure 2), so as soon as there’s a time that works for all, the meeting is automatically added to everyone’s calendar. No more email flood! Figure 2. FindTime polls meeting members and quickly finds a time that’s suitable for all. 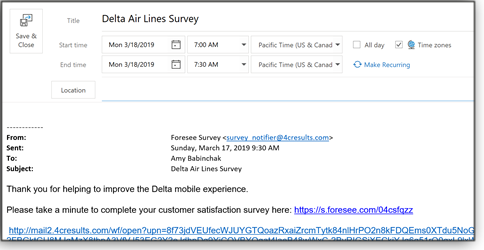 When you schedule an offsite meeting, it’s just polite to include location details in the invitation — and adding the ability to use GPS mapping is especially helpful. Here’s how you get that information into their calendar. It’s actually rather simple: Just fill out the location field when you create the meeting in your calendar (see Figure 3). 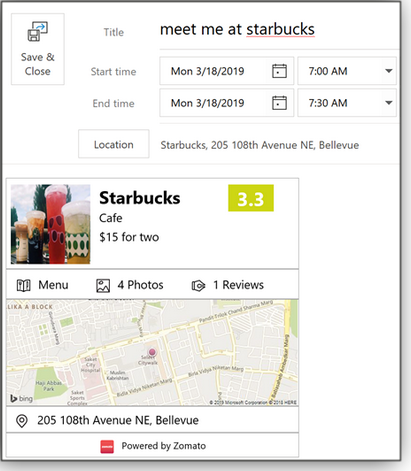 If you really want to get fancy, you can download another add-in such as Starbucks (see Figure 4) or Zomato and include the map in the meeting invitation. Figure 3. For offsite meetings, fill out the full address in the Location field. Figure 4. Add-ins such as Starbucks let you add a map directly into the invitation. When the meeting pops up on the attendees’ phones, they can click the location field and get GPS directions via their favorite mapping application, as shown in Figure 5. Figure 5. Clicking the meeting location can launch turn-by-turn directions in mapping apps. Maybe you were already having an email conversation and it turned into an appointment. How do you make sure that it gets into the appropriate calendars? 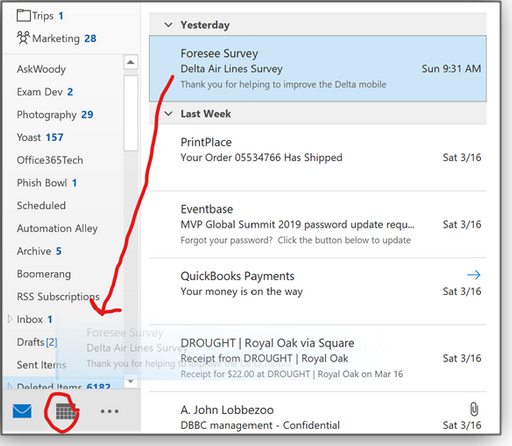 If you’re concerned only about your calendar, then drag-and-drop the email onto the calendar icon in Outlook (see Figure 6). If you’re using the latest version of Outlook, Cortana will guess the day and time and then place them into a new calendar item (see Figure 7). If the time, day, or place isn’t correct, you can easily edit as needed. Figure 6. Scheduling a meeting or appointment mentioned in an email can be as simple as drag-and-drop. Figure 7. Cortana might be able to pull the time and date from an email and automatically add them into a new calendar item. If you want to make sure the meeting is placed into the sender’s calendar, reply with a calendar attachment — they can then double-click to quickly update their calendar. To schedule a group meeting, start by creating a new appointment. Next, click the Invite Attendees button (see Figure 8). This adds boxes for inserting invitation email addresses and including meeting details (Figure 9). Figure 8. Add others to an appointment/meeting by clicking the Invite Attendees button. After entering all email addresses, hit send. Next — and this is where politeness comes in — you need to take the meeting off both calendars. To do so, double-click or right-click the calendar item and then click Cancel Meeting (see Figure 10). Figure 10. Press Cancel Meeting to remove an appointment from attendees’ calendars. You’ll be given the option to send the cancellation to all attendees (see Figure 11). Please choose this option; everyone will get a cancellation notice, and the event will be removed from their calendars. Figure 11. Outlook makes it easy to notify all attendees of a canceled meeting and have the event automatically removed from their calendars. Rescheduling an appointment works very much like canceling: double-click to open the appointment on your calendar and then make any changes to the date, time, attendees, or information in the notes area — anything. Click the Send Update button (see Figure 12) when you’re ready to push out the update to all attendees. Figure 12. To ensure all attendees know of meeting changes, edit your calendar and then press Send Update. Bottom line: Managing appointments isn’t difficult. You just need to stay within the calendaring system you’re using — including all changes and cancellations you might make. If, for example, you change a location, update your calendar and everyone else’s! We all need to remember that our friends’ and co-workers’ lives are just as busy as ours. And, as with us, keeping some daily order depends on keeping their calendars accurate. Keeping everyone updated is simply the polite thing to do. Amy Babinchak is the owner of three IT-related businesses: Harbor Computer Services, Third Tier, and Sell My MSP. She has been working in the IT field with small and medium businesses for more than 20 years. She’s also a Microsoft MVP and has received numerous leadership awards.